Pamio Design Modular lighting system for false ceiling. It consists of the aluminum modular box and of the lighting device. 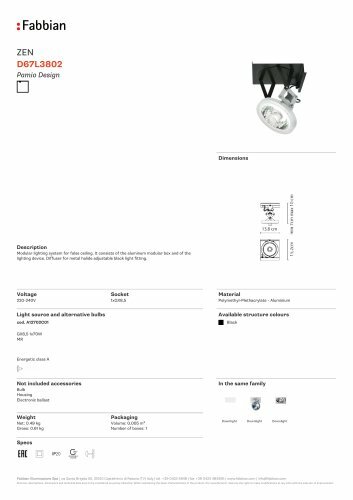 Diffuserfor metal halide adjustable black light fitting. Voltage Socket Material Light source and alternative bulbs Available structure colours Electronic ballast Down light Fabbian llluminazione Spa | via Santa Brigida 50, 31020 Castelminio di Resana (TV) Italy | tel. +39 0423 4848 | fax +39 0423 484395 | www.fabbian.com | info@fabbian.com Pictures, descriptions, dimensions and technical data have to be considered as purely indicative. While maintaining the basic characteristics of the product, the manufacturer reserves the right to make modifications at any time with the sole aim of improvement.